A reader recently noted that I don't cook with potatoes very often. It's not that I don't enjoy potatoes, but in general, I consume carbohydrate-packed foods like pasta and potatoes in moderation. 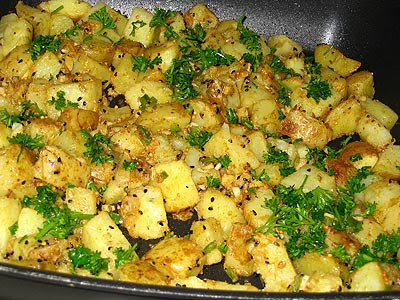 My reader's observation got me thinking about the versatility of such foods, however, and I quickly recalled one of my favorite spicy potato recipes made with "panch phoran", a spice mixture of fenugreek, nigella, mustard, cumin and fennel seeds (also known as panch phoron, panch puran, panchpuran, punch puram, punchpuram, and Bengali five-spice). If you don't happen to have any panch phoran on hand, it's easy to make your own and it keeps in a sealed jar for a good many months. Simply combine equal parts of each seed and store in your pantry until needed. Depending on the size of your pan and the quantity of potatoes you use, it might be necessary to fry the potatoes in two batches to ensure they brown evenly. Simply set the first batch of potatoes aside while you fry up the second batch and then return all of the potatoes to the pan before adding the spice mixture and lemon juice. Note: panch phoran is available commercially at Indian or Asian grocers, but it easy to make your own by combining fenugreek seeds, fennel seeds, nigella seeds, cumin seeds and black mustard seeds in equal amounts. Boil or steam the potatoes until they are almost tender. Let cool. Heat the ghee or oil over medium heat in a large non-stick or cast-iron skillet. Toss in the panch phoron and stir for a couple of minutes or until the spice blend becomes fragrant. Add the garlic, ginger, chilies and ground spices to the pan and cook, stirring, for about 1 minute. Using a slotted spoon, transfer the contents of the pan to a small bowl and set aside. Add the potatoes to the pan, adding more oil if necessary to prevent sticking, and gently fry the potatoes until they are golden brown and crisp — about 10 to 15 minutes. 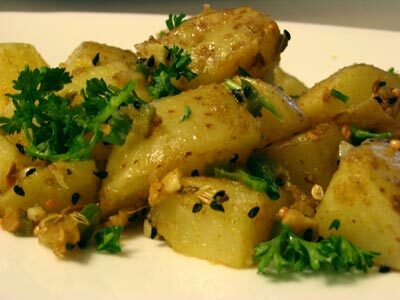 To finish off, stir the spice mixture into the cooked potatoes, along with the lemon juice and salt and pepper. Just before serving, sprinkle with fresh parsley or coriander. Sounds very good. I have no idea what panch phoron is though. My partner LOVES potatoes and could eat them every day so I'm looking for new exciting ways to cook them, I can't eat them plain! Recipe for panch phoron is here. These potatoes sound delicious; I LOVE potatoes!! One of our farmers market vendors sells the most delectable, creamy yellow potatoes. Thanks for sharing.